A bit of authentic French fare in Atlanta, including the ideal madeleine, lifts the heart and the soul. : Owner/founder Hamid Rouchdi transitioned his professional life from engineering to French pastry, and brought equipment from Europe to Atlanta to make pastries, including baguettes and croissants. The bright, airy space is a bit hard to find as it sits at the back of a shopping center, but good signage directs you to the spot. 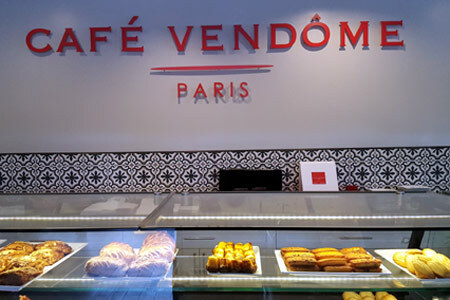 A lovely line of pastries and chocolates greets customers to the right. The chalkboard reveals the day's offerings. Start with a silky, full-bodied puréed vegetable soup; we found the portion enough for two as a starter. Then opt for any of the classical hot sandwiches, such as a croque madame and croque monsieur. We like the goat cheese-slathered tartine. Niçoise salad features all the usual ingredients, but we wish it used the tiny Niçoise olives, although the larger ones it includes are quite fine. For dessert, sample a couple of small canelés, a traditional Bordeaux treat. No alcohol.